Hey, ministry leaders. We put a ton of work into our student camps, trips, and retreats, don’t we? I mean, between the budget, programming, transportation, food, questions from parents, the registrations, the late registrations, and the so-late-they-actually-never-even-registered-and-just-showed-up registrations . . . Well, it takes a lot of work to pull these things off. But today, let’s take a second to remember that we’re not the only ones working hard on these trips. Our volunteers are working pretty hard, too. And, hey. Let’s be honest. Sometimes, I think our volunteers have an even more difficult job than we do. So before we plan our next round of camps, trips, or weekend retreats, let’s take a second to remind ourselves just how hard our teams work during these things, shall we? Or, perhaps, even more devastating . . .
I’m convinced the time our leaders spend on these bus rides are the equivalent of, like, a month of quality time. They’re a big deal. A huge deal. Also, those buses seem to never have air conditioning, so I’m pretty sure they get each of your leaders an extra jewel in their heavenly crowns. Between the sugar highs, the pranks, the late-night talks, and the fact that they’re probably sleeping in a sleeping bag in not-exactly-optimal sleeping quarters, four hours of sleep per night should be considered a success for your average volunteer. 6. They spend their money (and suitcase space) on candy and energy drinks. They bought it for their students, of course . . . but they usually rethink that strategy once the sleep deprivation sets in. 9. They get sweaty, dirty, and muddy. At least, I hope they do. If an entire camp or retreat passes without at least once dance party, you’ve got a problem, my friend. 11. They sing. And, if they do it right . . .
Yeah. Your volunteers have a pretty big job on their hands. 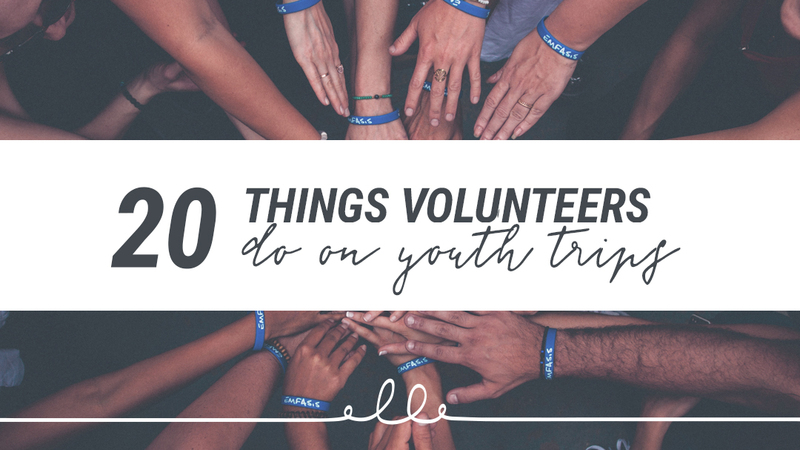 So the next time you plan a retreat, a camp, or a trip for your students, don’t forget, your volunteers are a really big deal. You can’t do this without them. So as you plan, plan with them in mind. Your volunteers make some pretty big sacrifices for their students. And they do it all as volunteers. They set aside their lives, their families, and their other many responsibilities. And they do it all . . .